3D mammography is a revolutionary new screening and diagnostic tool designed for early breast cancer detection that can be done in conjunction with a traditional 2D digital mammogram. During the 3D part of the exam, the X-ray arm sweeps in a slight arc over your breast, taking multiple breast images. Then, a computer produces a 3D image of your breast tissue in one millimeter slices, providing greater visibility for the radiologist to see breast detail in a way never before possible. They can scroll through images of your entire breast like pages of a book. The additional 3D images make it possible for a radiologist to gain a better understanding of your breast tissue during screening and the confidence to reduce the need for follow-up imaging. With conventional digital mammography, the radiologist is viewing all the complexities of your breast tissue in a one flat image. Sometimes breast tissue can overlap, giving the illusion of normal breast tissue looking like an abnormal area. By looking at the breast tissue in one millimeter slices, the radiologist can provide a more confident assessment. 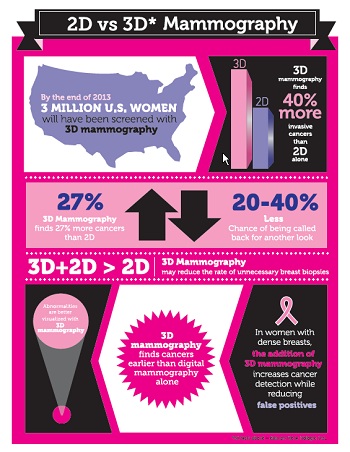 In this way, 3D mammography finds cancers missed with conventional 2D mammography. It also means there is less chance your doctor will call you back later for a “second look,” because now they can see breast tissue more clearly.